The caprese is a perfect summer dish, a fresh and fragrant starter that never goes out of fashion, we have revisited it in many ways: the caprese finger food, the stuffed mozzarella, the bruschetta caprese. Today we are suggesting a recipe that will make it even tastier: fried caprese. 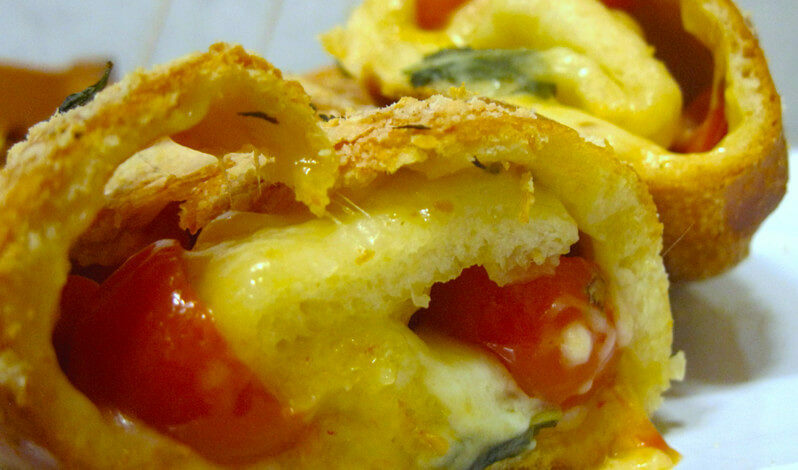 Two slices of tomato envelop a heart of mozzarella flavored with basil, all wrapped in a crunchy batter. The fried caprese is a perfect finger food to enjoy hot, an irresistible sin of gluttony, ideal to enrich your summer menus. To make the fried caprese, first make the batter: separate the egg white from the yolk. With an electric mixer, beat the yolk with a pinch of salt, pour in the milk while mixing and then add the sifted flour, a little at a time mixing until you get a smooth mixture. Separately, whisk the egg white until stiff and then incorporate gently with a spatula to the mixture so as not to lose the air in it. The batter is ready, hold it aside covered with film. Meanwhile wash and cut the tomatoes into thin slices and couple the slices of the same diameter that will be overlapped. Drain the mozzarella, slice it trying to get slices of the same width as the tomato slices. Then transfer the slices of tomato onto a tray, fill them with mozzarella, oregano and basil leaves, then cover with another slice of tomato to create a sort of sandwich. In a saucepan with high sides, heat the oil for frying, for an optimal result the oil should have a temperature of about 330 ° F.
Now take each caprese, dip it first in the batter to cover it completely and then, with the help of a skimmer, pass it in the oil to fry it. When the batter is golden and crisp, drip the caprese with the skimmer and place them on a tray covered with absorbent paper to remove the oil in excess. Enjoy your fried caprese hot!